Find Hyatt Regency Cambridge, Overlooking Boston deals, discounts and special offers. 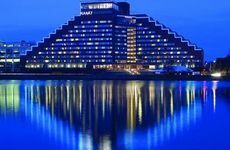 Nestled between Boston and Cambridge on the Charles River, this hotel is convenient to the pulse of both cities. Just moments from downtown Boston is this Cambridge hotel, which overlooks the city skyline and the Charles River. The Charles River is just outside the door of this pet-friendly, luxury boutique hotel. Unique, contemporary decor accents this luxury hotel which offers guests upscale dining at Sidney's Grille. Featuring 294 comfortably appointed guestrooms each with LCD TVs, this hotel features a day spa & indoor pool. This 175-room hotel on the historic Cambridge Common offers a sun deck, a fitness center, & a business center. This 20 room bed and breakfast offers complimentary WiFi and parking. Previously a country estate, the inn was built in the neoclassical Greek Revival style and has 20 rooms. Located within walking distance from Harvard and MIT, the B&B features 3 guest accommodations. This fourteen room bed and breakfast offers complimentary afternoon tea and wine and cheese. Located within walking distance of Harvard, this 44 room B&B offers convenient access to many Boston area universities. Located in Kendall Square, this hotel is minutes from MIT, Harvard and Boston University. Located on the Harvard University campus, this hotel features a sun-lit atrium and library. Centrally situated in Kendall Square, the hotel is steps away from MIT, Harvard, and Boston University. The pet friendly hotel is located in Kendall Square, in short distance from downtown Boston, MIT, and Harvard. Located five miles from the airport, the hotel is also close to MIT, area hospitals and Fenway Park.